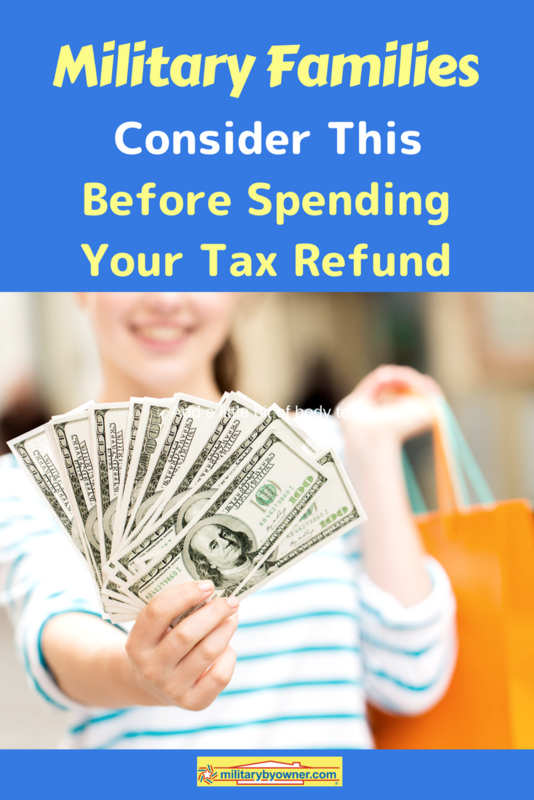 Military Families: Read This Before Spending Your Tax Refund! If you're expecting a nice tax refund check from Uncle Sam, you may be tempted to spend that money on some fun, like a trip or a large expense you've had your eye on for a while. But finding a way to spend that refund check more responsibly will make you feel better and more secure in the long run. With PCS season around the corner, many military families, myself included, are starting to research communities at new duty stations. While the government will help with many of the related costs, it's time to think about security deposits for rental, down payments on utilities, and buying new condiments for the fridge...moving is expensive. Your tax refund can go a long way in helping you get settled without debt! Travel for you and your dependents. You may be provided with train or airline tickets or the cost for purchasing those. You will also receive per diem to cover meals and lodging during your travel. Shipment of personal belongings and vehicle. You will be reimbursed for shipping your belongings, but there are limits based on your rank and family size. The government sets a limit for the amount of shipping and storage they will pay for. Temporary housing. If you move without having a place to live upon your arrival, you'll be partially reimbursed for temporary living quarters. You may also receive a dislocation allowance, which will partially reimburse you for expenses you incur in your relocation. Did you notice how many of the expense reimbursements and payments include the word “limits” and “partial?” Some of your expenses associated with relocation will not be covered and you’ll need to pay those out of pocket. If you have more items than your shipment allowance covers, you'll either need to cover shipping and/or storage fees of the extra items or find a way to get rid of them. If you move without setting up a new residence, the government will only give you a temporary housing allowance for a short time, so you’ll need to find a place quickly or pay out of pocket. Your tax refund is a good start to covering most, if not all, of those extra expenses. Using your refund responsibly to help with moving related expenses can help you get settled in your new home quickly and more comfortably, without worry. Your first grocery shopping trip to repurchase all of your condiments, frozen items, and pantry items that you were not able to bring. Unless you’re traveling a short distance, items from the refrigerator and freezer will not travel and you will have to throw them out and buy new. Restocking your fridge all at once can mean a hefty grocery bill. Early termination fees. While many companies are willing to work with members of the military who relocate, some charge early termination fees regardless. If you have a contract for gym membership, cable service, or cell phone and need to cancel the service instead of transferring it, you may get hit with a big fee. New household items. You may find that some of your furniture doesn’t fit in your new place or it doesn’t match. A new home or apartment usually means needing new household items like area rugs, shower curtains, bedding, brooms and/or vacuum cleaner, closet organizers, patio furniture, and a host of other items. You may even find that you need to rent a storage unit because all of your items don’t fit in your new place. Home expenses. Whether you’re buying or selling, moving comes with expenses like a down payment, Realtor fees, and home warranties and inspections. These are not covered under your relocation reimbursements. As you can see, the government will help with some of your moving expenses, but you can still incur a substantial bill yourself. If you haven’t budgeted for these expenses, you can find yourself in a very difficult financial situation upon your arrival at your new post. Instead of using your tax refund for something fun, like a vacation, holding on to it so you can use it to cover your moving expenses will help you feel more secure about your finances. Your refund may not cover all of your out-of-pocket expenses, but it can go a long way.